Ruth's grandmother taught her to crochet. She explored the art of crochet for several years before attempting to make crocheted clothing. That's when she discovered that knitted sweaters take about half of the yarn of crocheted ones and weigh accordingly less! While attending college at the University of Idaho, Ruth took a knitting class at The Needle Nook in Moscow, Idaho, and hasn't crocheted since. While in college, she knitted hats and then vests for every Christmas present--sleeves being too much of a commitment for a college student. After college, knitting was set aside. Fast forward almost two decades and a chance visit to Edla's Yarn Shop in Walsenburg, Colorado. She picked up the Interweave Knits issue with the pattern for Miriam Felton's lace shawl, Icarus, and rekindled her desire to learn lace knitting. After dozens of of knitted lace dishcloths, a doily or two and several knitted lace shawls, Ruth decided to try her hand at sock knitting. After an enchanted year or two with magic loop, socks on two circs, toe up, top down, short row heels, traditional heel-flap heels, German heels and even a couple self-invented heel variations, Ruth jumped ship and swam to the land of sweaters. She's currently running the gamut on that infatuation--but apparently, it's going to take a long time. She's knitted sweaters top down, bottom up, with raglan sleeves, contiguous sleeves and set in sleeves. And still there's more to learn! A voracious reader, Ruth tracks and reads close to 75 knitting blogs to keep current on the latest new patterns, yarns and design trends. She has an extensive knitting library and reads several knitting magazines. Her favorite knitting resources: Ravelry, of course, but most important, other knitters. "Knitters are the kindest and most generous people in the world," she said. "People are always willing to share techniques and ideas. I like to share what I have learned with others too. It's what makes knitting such a wonderful focus for travel. Everywhere you go, there are people who knit, and when you are among knitters, you are among friends. Is there any better way to travel?" Ruth spent one month traveling by herself in Europe with a Eurail Pass, spending most of her time in Norway. She also visited England, France, Switzerland, Italy, the Netherlands, Germany, Belgium and Luxembourg. She spent two weeks living on a small boat in the Alaska Sounds with a crew of foresters charged with the mission of spending each day hiking remote undeveloped areas--with bears. On her third trip to Australia, she spent three months house sitting in Sorel, Tasmania, for a woman she hadn't even met, taking care of her horses, her dog and her pet mouse. She said, "I like traveling, I'm not afraid to do new things. I have a lot of experience shepherding groups of foresters around--especially back when I used to fight forest fires. That was a crash course in leading groups! If you choose to join Craft Cruises Christmas Markets cruise, I think you will find that I am well-qualified to help guide you to some of the finest yarn shopping in Munich and along the Danube." 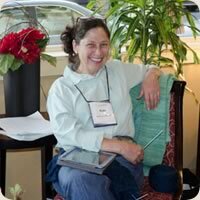 Ruth Carapella Is a fabulous knitter, trip leader and connoisseur of Wollmeise yarn. Ruth spends much of her free time training her two dogs, working with her two horses and knitting. Lots and lots of knitting! Ruth and her husband enjoy traveling and, over the years, have spent several months in Australia. Her meandering career path has led from retail sales to forestry technician, forester, forest engineer, freelance forester, graphic designer and writer. In her career as a freelance forester, Ruth published over 50 articles in forestry trade publications such as Timber West, Women in Natural Resources and Earth Observation Magazine. Since 1999, she has served as the editor for the newsletter for a local electric cooperative. Over the course of publishing more than 150 issues of this monthly publication, she has interviewed, photographed and written about scores of interesting people in all walks of life. Ruth went to the University of Idaho where she obtained a BS in Forest Resource Management. After completing college Ruth worked for the Forest Service as a forester for 14 years before embarking on an entirely new career path as a graphic designer and writer in 1994. Since then, she has managed Pen Craft Design Company, located in south central Colorado.